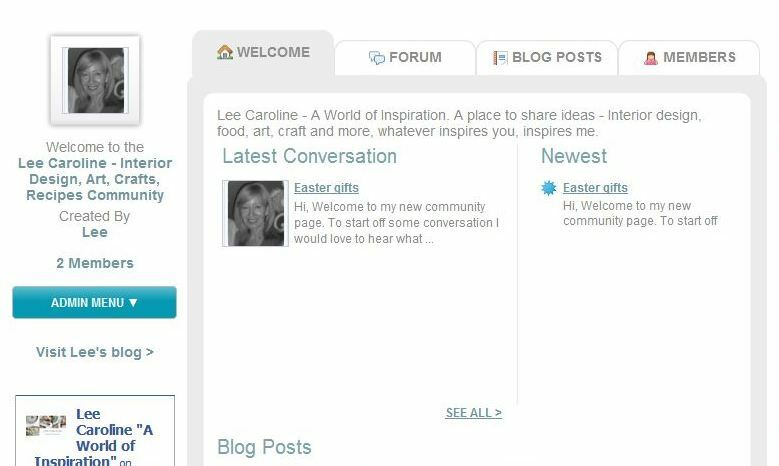 If your a regular visitor to Lee Caroline, you may have noticed I've added a new page entitled, "Join in my Community". This new page is a "live" community page where everyone can participate in discussions, share ideas, upload images and link to other communities and blogger's. I'm truly excited about the opportunity to be able to host this community and share with all of you. It's really easy to participate, just click on the tab above which says "Join in my Community" and it will take you to my page. I've also added a community box on my side bar which also links to my page. If you want to join in the forum, just click on the "Forum" tab. You can then use the forum to post a new topic or reply to a current topic, you can even upload your own images. If for example you have just taken a great photo of some Spring flowers, you can simply upload the image to share with the community. Your name will be linked to your blog address, so it's another pathway to your blog for others to follow. Alternatively if you click on the "Blog Post" tab you will see links to other bloggers posts within the community. Please check it out, I'd love you to join in, share your recipes, photos, art, crafts, interiors, diy inspirations, the list is endless and as time goes on and the community grows you can make new friends and contacts. Lee Caroline is about sharing inspiration and this new community opens up my world and enables you to share yours. Hi Lee, I've just joined your community! Looks like fun! Thanks Kifus, I think so too, lots more ideas to share and it will enable people to see your posts too. I'm new to your page and just checked your new link. Congrats to you new community link! I'm fascinated to crafts, art and interiors now; then in your page I got some links that may help me in my field of interest. Thanks Jasmin, I hope you will find lots of inspiration to help you in your interest.